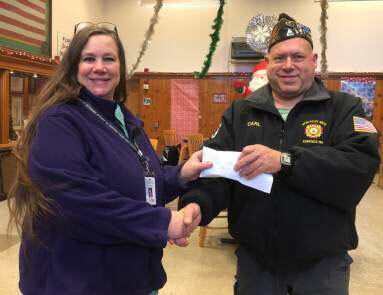 Just in time for Christmas, members of the Post Relief Committee delivered gift cards to the veterans homes at Retsil and Orting, as well as to the Chaplains offices of the active duty military installations around Puget Sound of all service branches. At below, Senior Vice Commander Carl Kurfess makes the presentation at the Orting facility. Other committee members helping with distribution included Dan Doyle and Rose Gilliland.